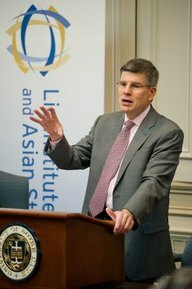 Kirby’s lecture, derived from an eponymous book forthcoming from Harvard Business Review Press and subtitled “Reaching the limits of power and growth,” was given in the Officers Meeting Room of Notre Dame’s Main Building to inaugurate the Liu Institute for Asia and Asian Studies Distinguished Speaker Series. Illustrating his presentation with nearly 100 slides illustrating modern Chinese history from the mid-19th century to the present day, Kirby discoursed on the conditions, controversies and promises of higher education in China and around the world since the 19th century, as the most consequential centers and systems of higher education have spread from Europe to the United States and, increasingly, to China. Among those listening to Kirby’s lecture was 2000 Notre Dame alumnus Justin Liu, president of the RM Liu Foundation and chief operating officer of Tireco Inc. A member of Notre Dame’s College of Arts and Letters Advisory Council, he also serves on the University’s Asian Studies Advisory Board. It was a gift of the Liu Foundation, which established the Institute for Asia and Asian Studies. At the conclusion of the lecture, J. Nicholas Entrikin, Notre Dame’s vice president and associate provost for internationalization, thanked both Kirby and Liu for their “leadership during a positive movement as we expand our scholarly and cultural engagement with China” and presented each of them with a commemorative plaque and framed photograph of Liu, Kirby, Entrikin, College of Arts and Letters Dean John McGreevy, and Liu Institute director Nelson Mark. Originally published by Michael O. Garvey at international.nd.edu on October 22, 2013.